Putin Defiant In Speech In Face Of Sanctions, Economic Woes : The Two-Way The Russian president said in his state of the union speech that the "difficulties" his country faces "also create new possibilities." He accused the West of trying to break up Russia. Russian President Vladimir Putin, in his state of the union speech on Thursday, defended the Kremlin's aggressive foreign policy, saying the actions are necessary for his country's survival. Russian President Vladimir Putin said today that the "difficulties" his country faces "also create new possibilities," and insisted that while he isn't interested in a "long-term arms race" with the West, Russia would do what it takes to defend itself. Putin's state of the union address to Russia's Parliament comes as his country's relations with the West are at their lowest point since the end of the Cold War. Russia's invasion of Ukraine's Crimea region set off a chain of events that has resulted in Western sanctions targeting Russia's economy, which has also been weakened by falling oil prices. The situation is compounded by a fragile cease-fire between pro-Russia separatists in Ukraine and the government in Kiev. Putin insisted today that the invasion of Crimea was a "historic reunification." "Crimea is of huge and sacred importance to Russia, just like the Temple Mountain is to those who follow Judaism," he said. Putin also accused the West of trying to build a new "Iron Curtain" around Russia, saying the crisis in Ukraine was merely a pretext for the West to isolate Russia. He said the West's goal was to break up Russia, in a manner similar to Yugoslavia. "The deterrence policy was not invented yesterday," he said, "it has been always conducted toward our country, for decades, if not centuries." He added: "Every time somebody considers Russia is becoming too powerful and independent, such instruments are turned on immediately." Still, tensions with the West have hurt the Russian economy, which faces a recession next year. Oil prices are around $70 per barrel. Russia's budget is predicated on oil being priced at around $100 per barrel. The country is a major oil and gas producer. Since the crisis began in March, the ruble has lost a third of its value. In his hourlong speech today, Putin outlined steps to bolster the economy, but the markets appeared unimpressed. 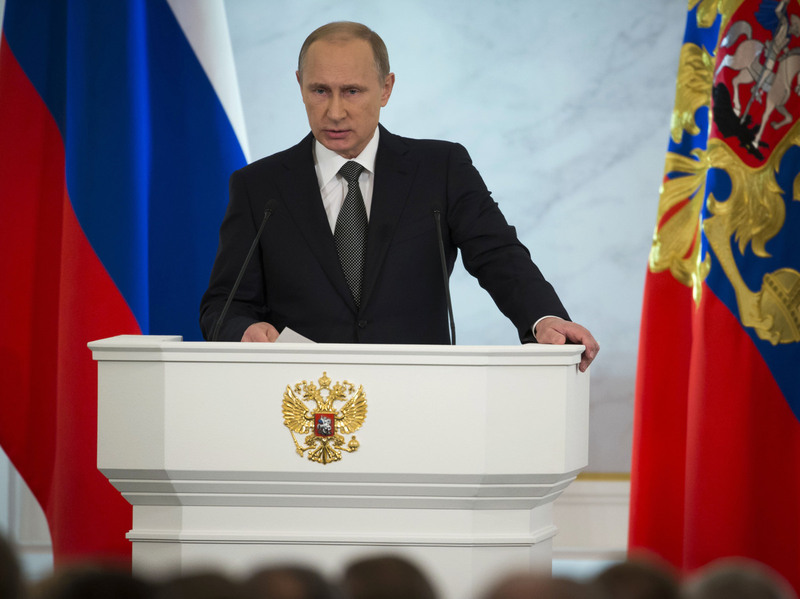 Putin's remarks came hours after an attack by militants in the Chechen capital, Grozny. Russian officials said 10 police officers were killed and 28 wounded in the gun battles with militants. Six other people were killed along with at least nine militants. "Those 'rebels' have again manifested themselves in Chechnya," Putin said in his remarks. "I'm sure the local guys, local low-enforcement bodies, will cope with that. ... Let's support them."